It seems like there's more scenic base options out there these days than ever before. Today you really don't even have to create your own basing if you don't want to. With so many options to choose from now, all any gamer needs to do is paint up a resin base, and they can end up with a really nice looking platform to display their model upon. 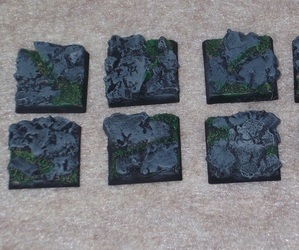 No glue, no flock, no rocks, quite frankly a scenic resin base is a short cut, which can eliminate a lot of work. When it comes to scenic resin bases, Micro-Art Studio is one of the most commonly recognized names that comes to mind. Today I'll show you a variety of the newest bases and styles from Micro-Art Studio. 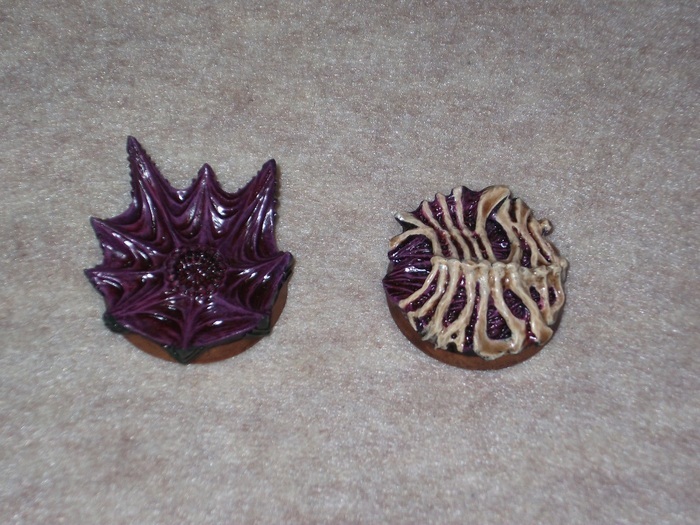 The Hive Bases is one of the newest additions to the Battle Bases range from Micro-Art Studio. These come in 25mm round, 40mm round, and in two distinct 60mm round designs. 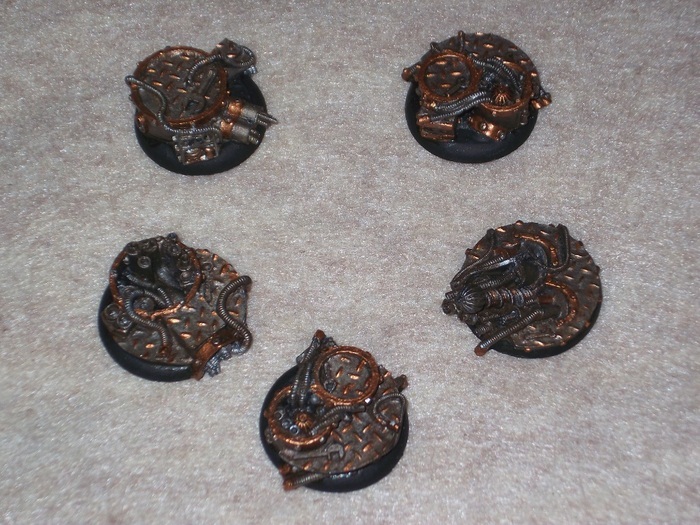 The 25mm round Hive Bases come in packs of 5 bases per pack. 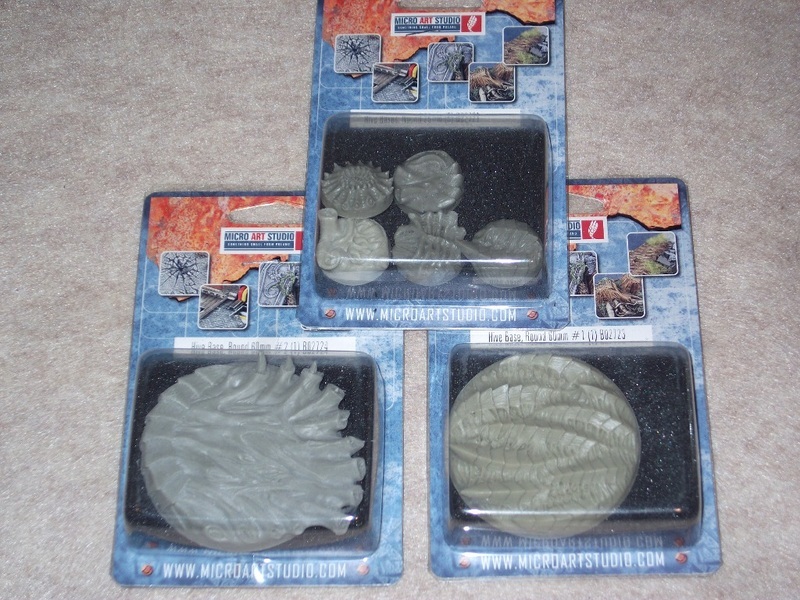 The 40mm round bases come in a pack of 2 bases per pack, and the two different 60mm bases come one base to a pack. All of these bases were sculpted by Piotr Kupper. 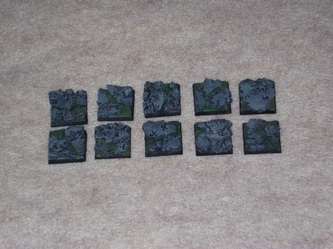 These are also the standard Games Workshop style base, as these are the beveled bases, not the round lipped display bases. These by design are definitely ideal for Tyranid players, or those who would like to depict Tyranid hunters. If you ask me, I think these would look nice under the feet of Space Wolves or Ultramarine models, to depict them walking on a hive-world. The 25mm pack comes with 5x resin bases, in a random assortment of models. I counted about roughly seven unique sculpts being available by looking at the picture from their website. In the pack I was sent there's 5x unique sculpts provided. To end up with one of all the sculpts you'd have to be quite lucky, or you'd have to handpick through blister packs at a brick and mortar game shop, where you can see the packages first-hand. Otherwise it's totally random what you'd end up with. 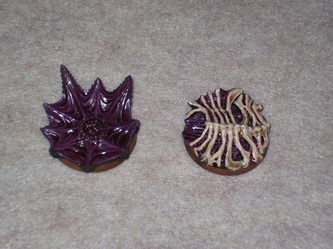 The 40mm Hive bases are made up of a variety of six unique sculpts, and each blister with 2x bases are packaged at random too. The ones I ended up with are quite nice, so I can't complain. I really like the big rib-cage-looking one, and that's one of the two I ended up with. 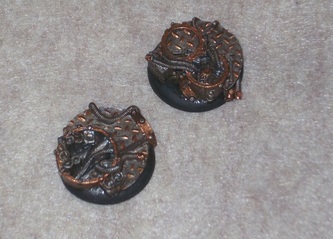 Also the giant-mouth-like contraption one is the other 40mm base included in my pack. Both of which are really nice, with very crisp and pronounced details like all of the bases in this range. This is another really unique looking variety of base models. These come in 30mm round lipped display base size, 40mm round lipped display base size and in 60mm round lipped display base size. These aren't the beveled traditional GW style bases, instead these are more like the style of bases that Privateer Press made popular with Warmachine. It's also the style of base that more and more companies are using today, because they just look better all around. The 30mm pack comes with 5x randomly packed bases, from an assortment of what looks to be 9x different base sculpts available in all. Sadly in the pack I ended up with, I received two of the same sculpts, so I only ended up with 4x unique sculpts to work with. Although they're all so nice, that I really can't complain too much. I really like the deck plating motif, with bits of machinery and wiring all over the place. There's six different sculpts available in the 40mm bases in this style, and three different sculpts in the 60mm variety. 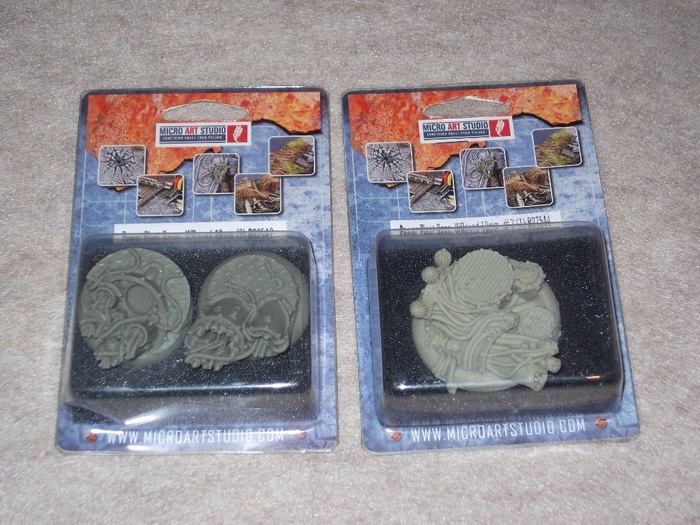 These are really ideal for most any sci-fi or post apocalyptic skirmish game setting that utilizes the round lipped style 30mm/40mm/60mm display quality bases. 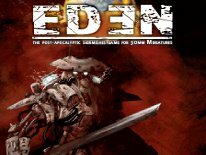 Games like AE Bounty, MERCS Minis, Warmachine, Eden, even the Reaper Chronoscope line all use bases of this style. You may be wondering why I've included these, as these aren't new, they're old actually. Quite frankly, sometimes you want or need a simple base that looks good, but is easy to paint and prepare for a model. 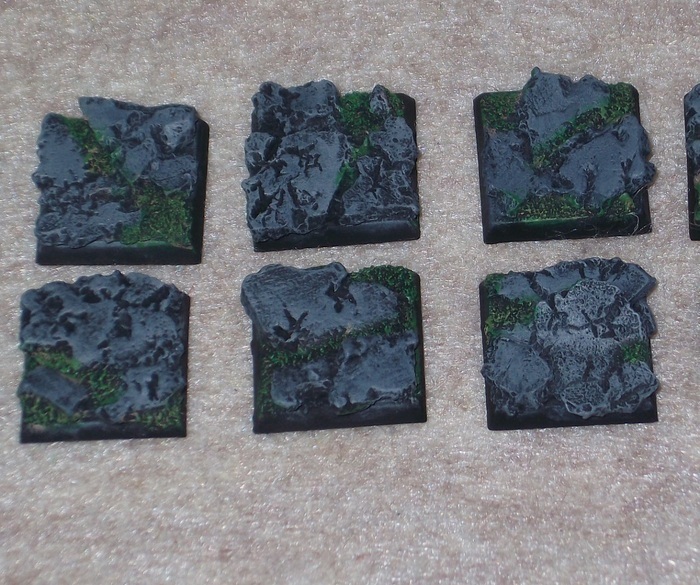 These 20mm square Ruins style bases are ideal for basing in a hurry, especially when it comes to Warhammer Fantasy Battles, Mantic Games Kings of War, and other models that call for 20mm square bases. When you're dealing with a lot of troops, in formations no less, a base like this can save you quite a bit of time and effort. These come in a variety of shapes and sizes ranging from 20mm square to rounded 25mm X 40mm bike bases, and every size imaginable in between too. These don't have as big an impact visually as some of the other bases in the Battle Bases range from Micro-Art Studio, but they're so easy to prepare and paint, which is why I selected them. 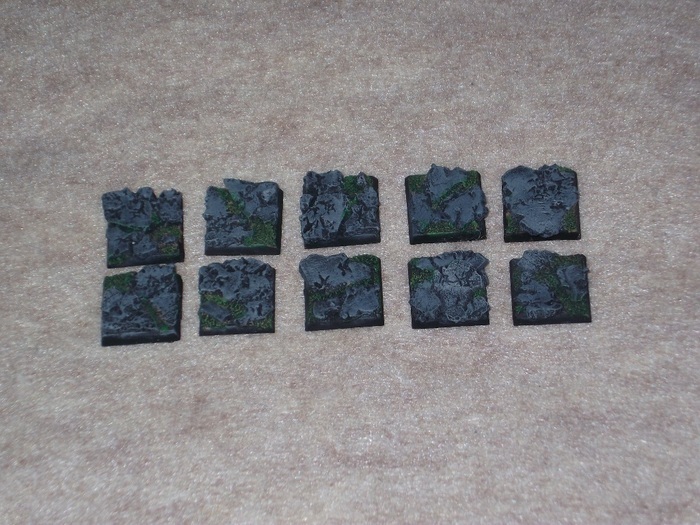 If you're in a hurry, it doesn't take much to prime these black, dry brush them with various shades of gray, and highlight them around the edges with white, and in a matter of minutes you have some tabletop quality looking bases for most any model. These certainly beat gluing some flock or gravel down, and peppering in some static grass. 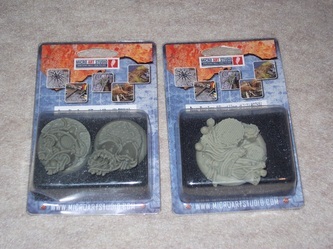 If you were working with say the Mantic Games models, sure the bases might cost as much as the models, but by the time you're through, you've only invested $2 per model, with the cost of the Ruins bases included no less! Once again Micro-Art Studio comes through with a really nice assortment of bases. I can't really complain about anything, other than the fact that I'm starting to see how the random assortments can be somewhat of a bummer, especially if you're trying to end up with every one of the unique sculpts. No matter how you look at it, they still make some of the best scenic resin bases on the planet. On average the 5-packs of 25mm-30mm bases, 2-packs of 40mm bases, and single 60mm bases are all priced at roughly $6 a package. Some might say that's expensive, but from what I've seen elsewhere, that's pretty much the going rate anymore. What's more, each and every sculpt is a little work of art within itself. The Micro-Art Studio has some of the best sculptors in the industry working for them, as I'm yet to see anything really bad, or a sub-par sculpt from them yet. Another plus is that these bases are widely available here in North America via a slew of online and brick and mortar retailers, so it shouldn't be hard at all to find any of the products reviewed here today.